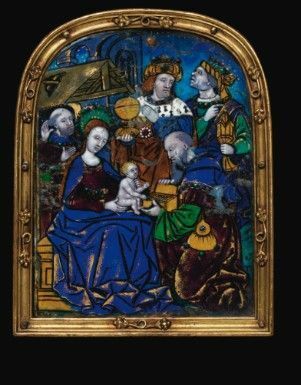 LONDON.- This monumental piece of French craftsmanship is featured in the Fine Silver sale at New Bond Street on 21st November (estimate £40,000-£60,000). 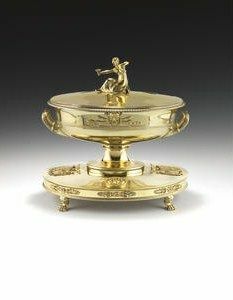 François-Désiré Froment-Meurice (1802-1855) was a French silversmith who achieved considerable fame and prestige during his lifetime. His list of patrons included Queen Victoria and Napoleon III and his objects can be seen in the V&A and the Musée des Arts Décoratifs. One of the plaques on the bowl of the centrepiece illustrates a ‘Bicycle’ locomotive pulling a train across the bridge at Argenteuil. This was a famous scene of inspiration for the impressionist painter, Claude Monet. Subtly embedded in the design of the centrepiece, it is a celebration of the new Arts of Industry and Commerce. At over half a metre in height and weighing almost twenty kilograms this important piece of industrial commemoration is a unique piece of silversmithing. Although the purpose of this work is unknown, the three relief plaques depicting scenes of rail engineering suggest it was probably created to commemorate the development of the rail link between Argenteuil and Ermont. 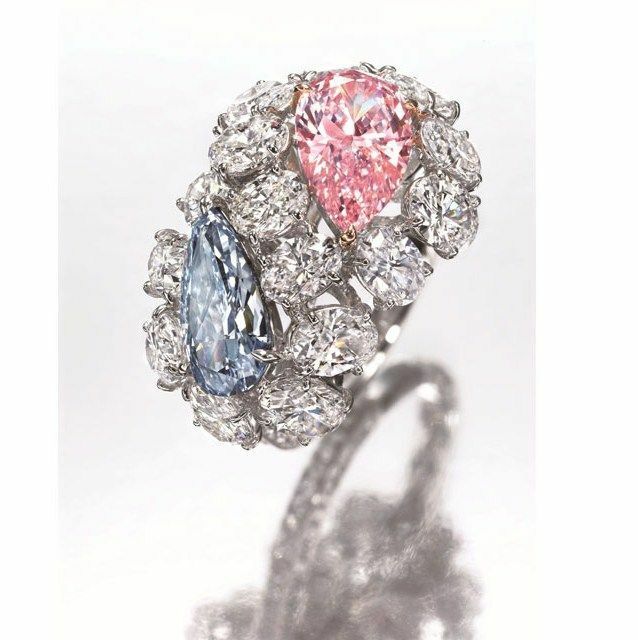 Notes: The firm of Froment-Meurice was established by François-Désiré Froment-Meurice (1802-1855), he was succeeded by his son Emile (1837-1913) who continued to increase the prestige of the firm, being commissioned to make the "Paris Tiara," a papal tiara given to Pope Leo XIII by the people of Paris in 1888 to commemorate his Golden Jubilee as a priest. At the 1867 Exposition Universelle, Froment-Meurice showed two garnitures that had been produced in collaboration with the sculptor Emile-François Carlier (1849-1927): the extraordinary ivory and blue enamel Garniture de Cheminée (exhibited Musée de la Vie Romantique 2003, Trésors d'argent, les Froment-Meurice, orfèvres romantiques parisiens, cat no 66) and theSurtout aux Fritillaires ordered by Emperor Napoleon III (now in the Musée Arts Decoratifs, inv. 14338 [A-à-C]). 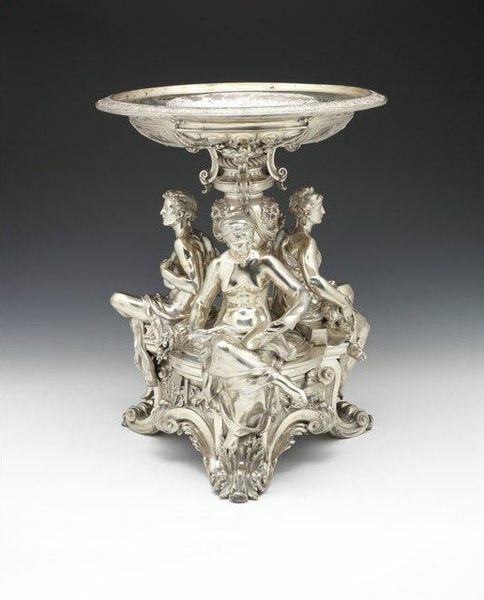 It is interesting to note similarities between the latter and the present lot that might suggest that Carlier was again involved in the design: the modelling of the classical figures seated on the centrepiece and the use of 'modernised' set of trophies below linked by swags. Froment-Meurice undertook a number of civic and commercial trophies and most are engraved with a dedication or prize. The present lot has no presentation inscription, however the three pictoral plaques give us clues as to the possible purpose of such an impressive piece of silver. Firstly, the facade of the Gare du Nord; the station was inaugurated in 1846 but less than 10 years later it was unable to cope with the rise in traffic and it had to be re-built. The facade was removed and can now be seen as the facade of Lille station. The new station was designed by the renowned architect Jacques Hittorf, famous for his design of the Place de la Concorde. It was re-built between 1861 and 1866 by Bridge & Roadway Engineers on behalf of the Chemins de Fer du Nord Company, this later facade is depicted. Secondly, the locomotive depicted exiting one of a pair of tunnels in the second plaque has been identified as a 12OT (ITT) or 'Bicycle,' more commonly used by the Compagnie de l'Ouest (which ran services from the Gare Saint Lazare) but they were also made for the Chemins de Fer du Nord (which ran services from Gare du Nord). The tunnels are most likely to be those at Batignolles, these were on the western line further help us to date the piece to before 1892 when a third tunnel was built. The third plaque depicts the 'Bicycle' pulling a train across the bridge at Argenteuil, famously painted by Claude Monet. Initially, it seemed there was nothing to link the three lines but with assistance from the Secretary of the Association pour la Sauvegarde de la Petite Ceinture de Paris et de son Réseau Ferré (ASPCRF), Bruno Bretelle and his associate, Luc Fournier, we have been able to identify a liasion 'ferroviale' that links the images. In the early 1860s a rail company was set up to link the towns of Argenteuil and Ermont, the line would serve both Gare Saint Lazare and Gare du Nord and solves the mystery of the three plaques. It is possible that it was made as a presentation piece to commemorate the inauguration of the line. This idea is supported by the the fact that Princess Mathilde, cousin of Napoleon III, opened the line on 13 August 1863. After the fall of the Empire, she continued to use the line from Sannois to reach her home in Paris near Gare St Lazare until her death in 1904. Also featured in the sale is an important French silver-gilt soup tureen, by Jean-Baptiste Claude Odiot (estimate £40,000-£45,000) and a Victorian silver centrepiece, based on Pliny’s Doves, by Hunt & Roskell (estimate £15,000-£20,000). Notes: Jean Baptiste-Claude Odiot (1763-1850) was received as a maître in 1785 after succeeding his father in the business. 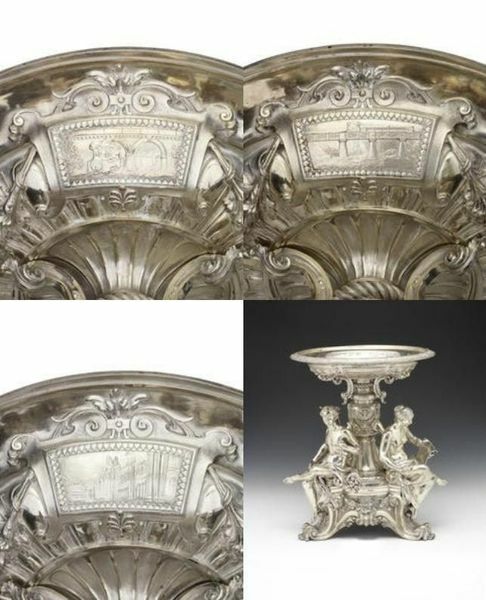 The firms reputation steadily grew and came to particular prominence following the Exposition de l'industrie held in Paris in 1802 where he was jointly awarded the gold medal with the celebrated silversmith Henry Auguste. Following Auguste's bankruptcy, Odiot purchased many of his models and designs soon replacing him as one of Emperor Napoleon's court silversmiths and confirming the company's rapid progress during his tenure. His work was characterised by strong Neoclassical forms incorporating cast figural elements attached with the use of bolts and rivets rather than the more conventional solder as well as his greater use of burnished surfaces. This style led to a huge influx of private commissions coming not only from the French Emperor but as far as the Russian Imperial court. This tureen is one such example. The magnificent Borghese service, comprising some 500 silver-gilt objects was primarily made by Odiot's great contemporary Martin-Guillaume Biennais (1764-1843) and with over 1,000 other pieces by various makers, it was thought to have been a wedding gift from Napoleon to his second sister Pauline Bonaparte (1780-1825) following her marriage to Camillo Borghese in 1803. Camillo, born in Rome, was the son of the pro-Napoleon Marcantanio IV and brother of Francesco, Prince Aldobrandini, entered French service in 1796. Upon his marriage to Pauline he became a prince of France in 1804, a troop commander in the Imperial Guard in 1805 and Commander of the 27th and 28th Division of the French army in 1809. Despite a floundering marriage, Pauline convinced her brother to give Camillo the governorship of Piedmont in 1808 and guardianship of Napoleon's prisoner Pope Pius VII soon after. After her death from cancer in 1825 and Napoleons fall from power, Camillo moved back to Florence in exile where he continued in secret and futile Bonapartist plots until his own death in 1832. This tureen is considered one of the latter editions to the Borghese service though pre-dating pieces made by Roman and Florentine silversmiths copying Biennais's designs during the 1820's. Pair of vases and covers with kakiemon decoration, probably paris, samson, 19th century. An important ormolu-mounted ebonised brazilian rosewood vitrine cabinet after a design by edouard lièvre, paris, late 19th c.